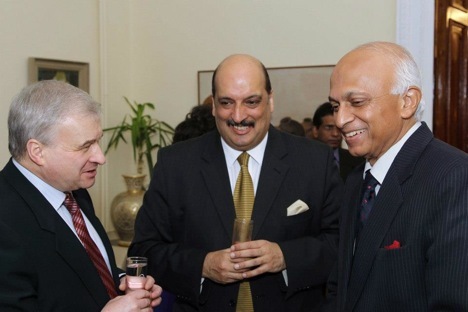 The Indian Foreign Secretary met his Russian counterparts to set the final agenda for talks between Manmohan Singh and Vladimir Putin on the sidelines of the BRICS Summit. Indian Foreign Secretary Ranjan Mathai visited Moscow this week for planned consultations at the Foreign Ministry level and confirmed that Russian President Vladimir Putin and Prime Minister Manmohan Singh would discuss hold a bilateral meeting on the sidelines of the upcoming BRICS summit. On a two-day official visit, Mathai held talks with his Russian counterpart First Deputy Foreign Minister Andrei Denisov. The consultation was also attended by Deputy Minister of Foreign Affairs of Russia I.V.Morgulov. “India and Russia have the strongest of bilateral ties among the BRICS countries,” Mathai noted, pointing out that besides imparting momentum in taking the BRICS agenda forward, India and Russia will see new ideas of bilateral cooperation emerge from the Durban summit. During their talks in Moscow, Mathai and Denisov discussed the implementation of agreements signed during the official visit of Putin to India in December as well as urgent bilateral, international and regional issues, including the agenda for Putin-Singh bilateral meeting on the sidelines of BRICS summit. They exchanged opinions on strategic sectors of cooperation such as nuclear energy, hydrocarbons and defence, along with other issues of bilateral significance in the economic, consular protocol and cultural areas. The bilateral meeting between Putin and Singh is the first since their summit level talks in New Delhi on December 24, when Russia and India signed 10 agreements in diverse areas, including their economic and military-technical ties. During his talks with Putin, Singh had reiterated India’s commitment to implementing the roadmap for cooperation in the nuclear energy sector signed during Putin’s visit in 2010 as then Russian Prime Minister. Since the December summit, as the first 1,000 MW unit of the Kudankulam nuclear power plant is expected to be formally commissioned in May, the Cabinet Committee on Security at a meeting chaired by Singh on Tuesday approved the proposal to grant administrative and financial sanction for building units 3 and 4 at Kudankulam site. Mathai and Denisov also discussed in detail the situation in Afghanistan, Syria, Iran and other regions. They also reviewed bilateral cooperation in multilateral forums, including UN, SCO, BRICS and G20, in particular, the coming BRICS summit in Durban and the G20 summit in September in St. Petersburg. Both sides agreed that close consultations between the two foreign offices on a broad range of subjects would continue through the year. “The parties stressed the special nature of the Russian-Indian privileged strategic partnership, confirmed their intention to maintain regular bilateral contacts and coordinate approaches and positions in international organizations and multilateral forums to promote peace, security and stability, effectively countering new challenges and threats, a multipolar world order,” the Russian Foreign Ministry said in a statement following the talks. Starting on March 25, Singh will lead a high-powered delegation to the BRICS summit, including Finance Minister P. Chidambaram and Commerce Minister Anand Sharma, National Security Advisor Shivshankar Menon and top officials from the PMO, Ministry of External Affairs and others departments. India will hand over the BRICS chairmanship to South Africa at the summit, whose theme is “BRICS and Africa: Partnership for Development, Integration and Industrialization.” A delegation of Indian businessmen would also be taking part in the summit. The Durban summit will be the first for Putin who will arrive on a working visit to South Africa on March 26. He had attended the BRICS leaders' meeting chaired by Singh in Mexico on the sidelines of the G20 summit in June 2012. A large Russian business delegation is accompanying Putin to the BRICS summit. The BRICS Business Council and a consortium of think-tanks are to be launched during the Durban summit. The idea for BRICS Business Council was formulated by Russia itself during a meeting between BRICS leaders in Sanya (China), in 2011. The BRICS Business Council will be tasked to promote trade between BRICS countries, and the consortium of think-tanks will be entrusted with the job of drafting strategy. The Summit on March 27 will be preceded by a number of pre-Summit events - BRICS Economic Forum on March 25, meeting of BRICS Trade Ministers on March 26 and BRICS Business Forum on March 26. It is likely that Russian and Indian businessmen will hold interaction to promote trade and economic relations within the framework of BRICS group, a told this writer on the condition of anonymity. As a grouping, BRIC was institutionalized in September 2006 at the initiative of Russia. The first informal meetings of BRIC leaders was held in July 2008 in Tokyo on the margins of the G-8 Outreach Summit. The first BRICS summit in this format took place at Russian initiative in Yekaterinburg in 2009. At the Durban summit, the leaders of Brazil, Russia, India, China and South Africa are expected to discuss crucial issues for the global economy, international and regional security, and ways to reform the global governance system. Special attention will be paid to opportunities for increasing economic cooperation between BRICS partners. Sources said that at the bilateral meeting of Putin and Singh, on the sidelines of BRICS summit in Durban, the likely issue of expansion of the BRICS in the future may also come up for discussion, as recently some more countries have expressed their desire to join the group. “There is no talk of BRICS expansion yet,” they said, referring to the Egyptian President Mohamed MorsI’s recent statement to join the bloc. As Russia will actively participate in BRICS discussion over Islamic radicalism, the issue of international terrorism is also expected to be discussed at the bilateral meeting of the Russian President and Indian Prime Minister at the Durban summit, sources said, adding both Russia and India have long suffered from the tragic attacks of terrorism. “Islamic radicalism problems will be discussed at the summit, and Russia will not stay away from this discussion,” presidential representative for Africa, chairman of the committee for international affairs under the Federation Council (upper house of the Russian parliament) Mikhail Margelov told reporters on March 19.